Two issues exist when businesses classify product costs for a manufacturer. They must distinguish between manufacturing and non-manufacturing operating costs, and determine how to allocate indirect costs among different products. Drawing a line between manufacturing costs and non-manufacturing operating costs: The key difference here is that manufacturing costs are categorized as product costs, whereas non-manufacturing operating costs are categorized as period costs. Wages paid to production line workers are a clear-cut example of a manufacturing cost. Salaries paid to salespeople are a marketing cost and are not part of product cost; marketing costs are treated as period costs, which means they are recorded immediately to expense of the period. Depreciation on production equipment is a manufacturing cost, but depreciation on the warehouse in which products are stored after being manufactured is a period cost. Moving the raw materials and partially-completed products through the production process is a manufacturing cost, but transporting the finished products from the warehouse to customers is a period cost. The accumulation of direct and indirect production costs starts at the beginning of the manufacturing process and stops at the end of the production line. In other words, product cost stops at the end of the production line — every cost up to that point should be included as a manufacturing cost. Example for determining the product cost of a manufacturer. If you misclassify some manufacturing costs as operating costs, your product cost calculation will be too low. Also, the Internal Revenue Service may come knocking at your door if it suspects that you deliberately (or even innocently) misclassified manufacturing costs as non-manufacturing costs in order to minimize your taxable income. Allocating indirect costs among different products: Indirect manufacturing costs must be allocated among the products produced during the period. The full product cost includes both direct and indirect manufacturing costs. Creating a satisfactory allocation method is difficult; the process ends up being somewhat arbitrary, but it must be done to determine product cost. 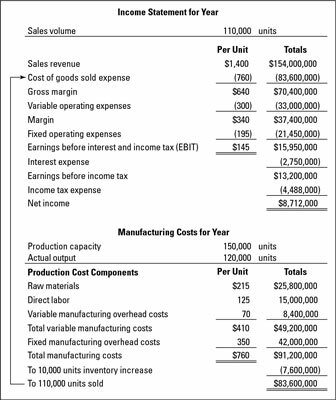 Managers should understand how indirect manufacturing costs are allocated among products (and how indirect non-manufacturing costs are allocated among organizational units and profit centers). Managers should also keep in mind that every allocation method is arbitrary and that a different allocation method may be just as convincing.